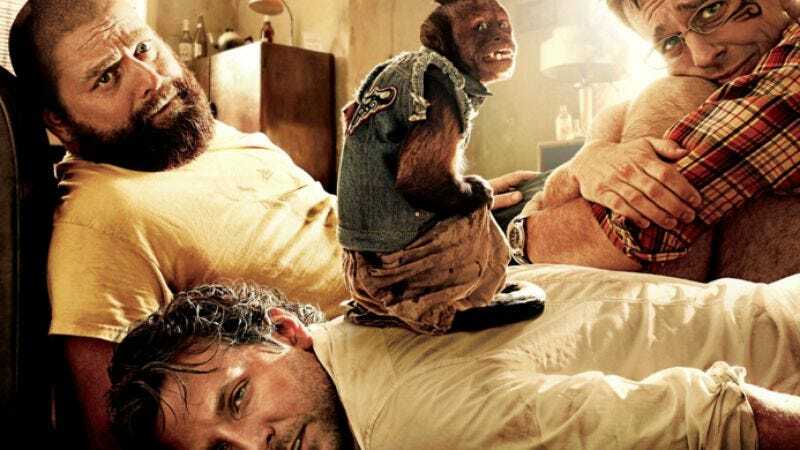 In deference to its Thailand setting, The Hangover II serves as an illustration of the Buddhist symbol of the endless knot, where we are all bound together in eternally repeating cycles of suffering. Or maybe it’s just that sequels to unlikely comedy blockbusters tend to replicate the formula of their predecessors with only slight deviations, logic be damned, all in an attempt to try capturing lightning in a bottle twice. In that sense, The Hangover II probably puts a greater strain on credulity than any sequel since the last Home Alone, with Ed Helms, Bradley Cooper, and Zach Galifianakis’ “Wolf Pack” going through an almost note-for-note rehash of their Las Vegas experience—at one point, Helms’ character actually exclaims, “I can’t believe this is happening again!”—only this time on the seedy streets of Bangkok. Thus, missing teeth have been replaced by face tattoos, the sunglasses wearing-baby has been swapped out for a denim vest-rocking monkey, and instead of searching for Justin Bartha’s milquetoast other guy (a role he’s still relegated to here, apparently), they’re desperate to find Helms’ would-be young brother-in-law. But judging from the trailer, at least, much of the overall setup and execution is the same, except with an added boost of volume thanks to the addition of machine guns and a far more pronounced Ken Jeong, whose illogical presence here is the most overt shrug of “”just giving the people what they want.” Still, no need to reinvent the wheel, we suppose; we look forward to The Hangover III: Now It’s In Outer Space.